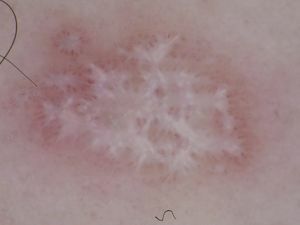 Description This chapter describes dermoscopyThe examination of [skin lesions] with a 'dermatoscope'. This traditionally consists of a magnifier (typically x10), a non-polarised light source, a transparent plate and a liquid medium between the instrument and the skin, and allows inspection of skin lesions unobstructed by skin surface reflections. Modern dermatoscopes dispense with the use of liquid medium and instead use polarised light to cancel out skin surface reflections. of lichen planusThis glossary term has not yet been described. Lichen planus Lichen planus – cite! Lichen planus (message) Lichen planus – participate! White crossing streakslines radial (always at periphery) streaks Reed nevus melanoma recurrent nevus (Wickham striae) are the hallmark of lichen planus not only in clinical examinationThis glossary term has not yet been described. (particularly in mucous lesions), but also in dermoscopy. White crossing streaks are a specific, as well as a constant finding for lichen planus, irrespectively of lesion’s duration or subtype. VesselsThis glossary term has not yet been described. of mixed morphologyThis glossary term has not yet been described. (dotted and linear) may be found at the periphery of the lesion. ↑ Vázquez-López et al. : Dermoscopic features of plaque psoriasis and lichen planus: new observations. Dermatology (Basel) 2003;207:151-6. PMID: 12920364. DOI. ↑ Zalaudek & Argenziano: Dermoscopy subpatterns of inflammatory skin disorders. Arch Dermatol 2006;142:808. PMID: 16785400. DOI. ↑ Vazquez-Lopez et al. : Dermoscopy for discriminating between lichenoid sarcoidosis and lichen planus. Arch Dermatol 2011;147:1130. PMID: 21931067. DOI. This page was last modified on 11 November 2017, at 18:09.